"Everyone, friends! Everyone, friends!" GKids has released the US trailer for the extremely cute, Japanese anime musical Lu Over the Wall, which won Grand Prize at the prestigious Annecy Animation Festival, and played at the London Film Festival last year. From Japanese anime filmmaker Masaaki Yuasa (Mind Game, "Devilman: Crybaby"), this "joyously hallucinogenic" film is about a lonely, awkward musician boy in a small Japanese town on the water. One day he meets and befriends a mermaid who loves to dance to the music he creates with his band. This sets off all kinds of problems in the village, where they're afraid that mermaids bring disaster. The voice cast includes Kanon Tani, Shôta Shimoda, Shin'ichi Shinohara, and Akira Emoto. However, the US release is an English dubbed version, for those thinking of seeing this. I caught this film in London and did not like it at all, very messy and incoherent and way too long. Have fun. Kai is talented but adrift, spending his days sulking in a small fishing village after his family moves from Tokyo. His only joy is uploading songs he writes to the internet. When his classmates invite him to play keyboard in their band, their practice sessions bring an unexpected guest: Lu, a young mermaid whose fins turn to feet when she hears the beats, and whose singing causes humans to compulsively dance – whether they want to or not. As Kai spends more time with Lu, he finds he is able to tell her what he is really thinking, and a bond begins to form. But since ancient times, the people in the village have believed that mermaids bring disaster and soon there is trouble between Lu and the townspeople, putting the town in grave danger. 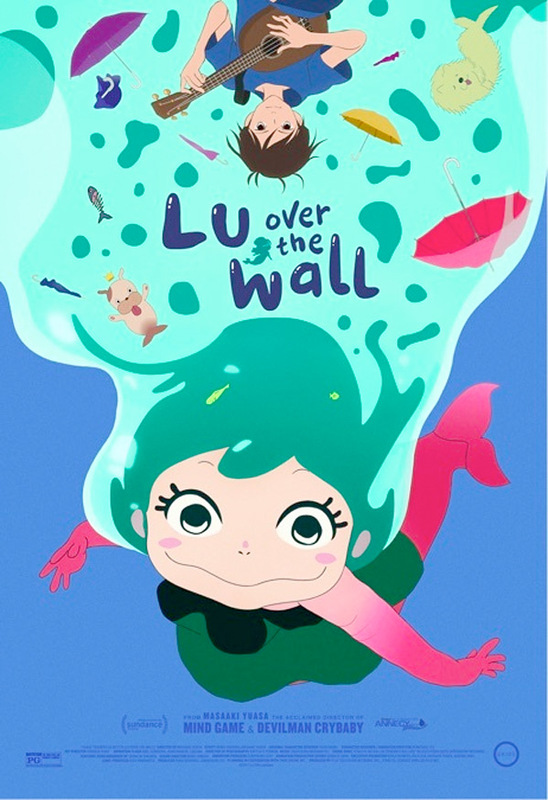 Lu Over the Wall is directed by Japanese anime filmmaker Masaaki Yuasa, of the films Mind Game, Genius Party, and Night Is Short Walk on Girl previously. The screenplay is written by Reiko Yoshida and Masaaki Yuasa. This first premiered at the Annecy Animation Festival last summer. GKids will release Yuasa's Lu Over the Wall in theaters nationwide starting May 11th this summer. Who's interested?